When looking for inspiration for small kitchen renovation ideas there’s often a lot more to consider than you probably initially reasoned. Due to limited space, a small kitchen renovation can sometimes be difficult to implement without clever planning and research. However, having a small kitchen also comes with its own benefits and advantages. One, of course, being, a lower cost of renovation as having your kitchen renovated can likely be an expensive endeavor the larger it is. Another is how many more details you have to factor in when your kitchen has more amenities due to the flexibility more space allows you. So what to do with a small kitchen? By implementing the right small kitchen design ideas, your small kitchen can be upgraded to appear larger without having to spend a lot of money. Depending on the look that you want to achieve, there are many ways to go about your small kitchen renovation process. You can simply spruce it up a bit by changing some of the appliances, furniture, and fixtures or you can implement a major small kitchen renovation that requires a complete room redesign. Whatever approach you go for, our interior designers are here to inspire you as they share clever small kitchen design ideas that to help make your space appear bigger without going beyond your budget. Looking for a budget-friendly small kitchen remodel that’ll leave the heart of your home looking much larger, more expensive, and refined than it really is? When it comes to genius small kitchen makeovers that won’t break the bank or take years to pay off, light-reflecting mirrors are a savvy way to go. From backsplashes to kitchen cabinets, mirrors, though harder to keep clean, are a brilliant way to really emphasize more space and light than there really is. The key here is to make sure that every aspect of cabinetry fits perfectly as you don’t want to highlight any imperfections. When it comes to small kitchen makeovers, sometimes the best routes are to keep the room’s small scale in mind to develop clever takes on making the most of the space. And by that we mean, if you don’t have space for a massive range, you have to be realistic because its simply impossible to make it work on your behalf. Take note of how the small kitchen featured above uses concealed cabinets to keep the look sleek, while boasting appliances with a footprint so light, that they literally blend right into the walls for an ultra-cool, minimal look that keeps the eye focused. Every thing here has a rhyme and a reason, with nothing superfluous or unneeded in the mix. Again, when it comes to smart small kitchen remodel ideas, sticking to subtle and refined with a minimal spirit is a winning way to keep the space visually flowing and not overstimulating. To make the most of a small kitchen renovation while keeping everything feeling modern, rid your space of extra visual noise and remove excess hardware, and just about anything else unneeded to keep the look clean and disciplined. If you’re starting to see a common theme between small kitchen remodel ideas, you’re on the right track. And to keep small kitchen makeovers consistent in feel and style, stick to a concise plan and colorway to make the most of your limited space. Note how the small kitchen illustrated above features hardware less cabinetry, matte finishes, and just two tones to tie everything together. Go for a similar look in your challenging space by keeping things in three’s: no more than three colors, three finishes, and just about three of anything for that matter. Because sometimes its easy to overlook making the most of every area when considering small kitchen remodel ideas, expand your reach from the ground up. If you’re lucky enough to have high ceilings, make those a key factor for maximizing the space during your small kitchen renovation with floor-to-ceiling cabinets and shelves to house elements you use less often. Plus, tall cabinets and high-reaching shelves will also work to make the room appear much more grand in scale. Cabinet doors featuring glass panels can work to lighten up and modernize the look of your kitchen cabinets. Since the doors boast transparent panels, they allow the eyes to travel through to the back, making a small kitchen look bigger. Well made glass cabinet doors will also lend your cabinets a sophisticated air while boosting your home’s property value. Bear in mind that since this is for your small kitchen renovation, we highly suggest styling what you place in each cabinet or the accumulated clutter will defeat the purpose. Another effective approach for your small kitchen renovation is to paint your cabinets the same hues as your kitchen walls. Doing this erases visual boundaries that could otherwise stop the eye while enveloping the room with uniformity. According to our interior designers, the best colors for a small kitchen are pale shades that are capable of reflecting light, which makes the space look and feel larger. However, this should not stop you from opting for darker colors, especially if your home already leans that way aesthetically. You can still incorporate dark colors for your small kitchen renovation by choosing the right shade. For dark colors, the best colors for a small kitchen are navy, charcoal, chocolate, and black as they recede visually, creating an impression that the walls are farther than they actually are. Incorporating open shelving to expand kitchen storage is one of the smartest and easiest tried-&-true small kitchen design ideas that can help open the room up dramatically. Open shelving looks great and can work well for a small space since it’s capable of occupying tight spaces. It’s also a great way to showcase beautifully designed appliances and accessories while highlighting collectible tableware and decorative objects. Open shelving will also make your kitchen look brighter and more open during the day since they allow light from windows to be able to shine through without any hindrance. Creating open shelving is a budget-friendly and simple upgrade as its one of those timeless DIY small kitchen design ideas that won’t break the bank or be something you quickly tire of. Remodeling a small kitchen to look bigger may also require replacing the furnishings – for good reason. One of the most effective small kitchen design ideas is choosing furniture and fixtures that will not occupy a lot of space. For instance, if you have a petite kitchen island, we suggest coordinating slim chairs or streamlined stools. For your small kitchen renovation, consider a more narrow kitchen counter than you initially envisioned as it won’t eat up a lot of valuable space in your kitchen. Just make sure to avoid buying furniture with chunky legs and thick bases since they will only add visual bulk. What’s the simplest way to make a small kitchen look and feel larger than it really is – and any room frankly? Simple – welcome plenty of light into your space any way you can. The brighter your kitchen, the bigger it will appear. When it comes to your small kitchen renovation, bring in plenty of natural light into the space. Whether your kitchen is painted in dark or pale colors, light beaming in will help in making a small kitchen look bigger and more uplifting. To do this, if necessary, go ahead and eliminate window treatments. But if you really need to have window treatments, try to keep them simple so as not to block sunlight or appear busy. Remember that when it comes to small kitchen design ideas, it’s always a good idea to keep decoration minimal. If you are concerned that you need to do a drastic makeover for your small kitchen renovation, go all the way with an open kitchen floor plan. An open floor plan is a terrific solution if you’re wondering what to do with your small kitchen and have extra space to play for. A great way to your small kitchen design ideas reflective of the space you have at hand is that instead of separating your breakfast room, try to merge it with your kitchen. Our designers suggest using a low half wall to divide or separate your breakfast nook from your cooking area. By doing so, your breakfast nook will look like a natural extension of your kitchen, which is a great solution if you’re wondering what to do with a small kitchen. It’s unfortunately all too common for small kitchens to face challenges with storage space and concealing essentials. One of the most effective tips for making a small kitchen look bigger is to streamline storage units. For instance, you can design the shelving, pantry or cabinets to work alongside one area of a kitchen wall. This way, they won’t obstruct the flow of your kitchen and will give the illusion of a bigger space. You can also use a corner appliance garage to reclaim lost storage space. This extra storage space can also be used to hide your small kitchen appliances such as blenders, coffee makers, and toasters. Another popular and often underutilized small kitchen design ideas is to direct the eye upward. Decorate your kitchen with patterns and visual elements that keep the eye centered on an entire wall instead of focused on small details. For example, you can paint vertical lines on the wall or install ceiling boards. These small kitchen design ideas will lend an impression of greater height, which makes the space to look bigger than it really is. Your choice of a range hood can also be critical for your small kitchen renovation. When looking to make a small kitchen look bigger, opt for a sleek wall-mounted vent hood that can trim the visual bulk from a wall of cabinets. 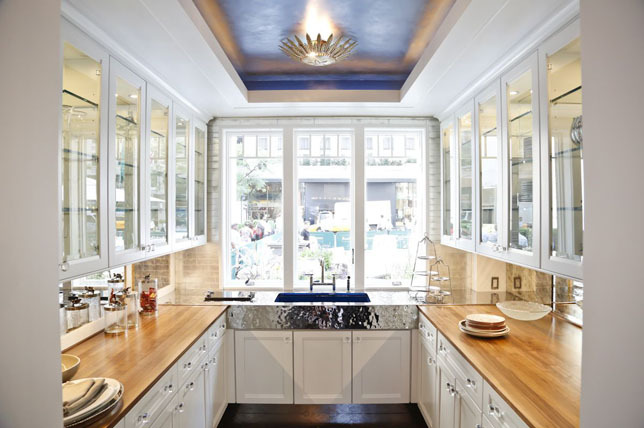 This style of hood can give the kitchen a feeling of openness. Vent hoods with minimalist designs usually only require 30 inches of space in between cabinets, which is about the same as the under cabinet hood, and it will give a lighter and streamlined appeal – which is exactly what you need for your small kitchen renovation. Like in just about any room, the use of reflective surfaces is among the most effective small kitchen design ideas that you can incorporate into your kitchen. Marble countertops and ceramic tiles are some easy, attainable examples. Stainless steel, which is one of the best fabrications for any small kitchen, can help to subtly amplify the effect of natural light into the space, thereby, making your small kitchen look bigger. To maximize the reflective surfaces install inventive lighting throughout your small kitchen such as under cabinet lights or pendant lights. Aside from helping make the room appear larger, these lights will also substantially improve the overall functionality of your kitchen. Undertaking a small kitchen renovation may be a bit difficult, but the inspiring ideas above should get you started on the right foot.